Stay luxury and experience the desert through the eyes of its people. 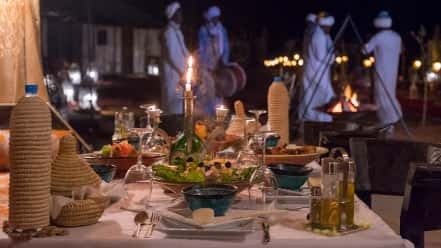 We are just a moment in time, an ephemeral blink of an eye, our lives are all about moments so make them count and join us at Erg Chebbi & Merzouga Luxury Desert Camp in Morocco where the magic can truly happen. Under the dark sky of the African Desert surrounded by golden sand dunes indulging the beautiful and delightful sight of beholding the stars and the moon. Find yourself and your inner-peace in the middle of nowhere and lose yourself in a moment of pure spiritual ecstasy; in which an artful piece of nomad music around the fire touches the very core of your being making you dive into the beauty of a peaceful life. A total soulgasm that you had never experienced before. Amazing trip to Erg Chebbi!! We chose the 3 days tour to Erg Chebbi and the trip was amazing! We started in Marrakesh and went through the Atlas mountains where the views are breathtaking right at the start of the tour! But this is just the beginning and it keeps getting better as you approach the desert. Along the way you get to visit a lot of more beautiful places and our guide, Faissal, was always very helpful and friendly answering all our questions! On the next day we arrived to the desert and went on a camel ride to the encampment where you stay at night.The ride is very funny, it was the first time ridding a camel and was very enjoyable. Along the way we saw the sunset wich gives you the opportunity for excellent pictures and memories! We ended this night watching the stars, never seen the sky so clear with so many stars! The next day we went back to Marrakesh. These are three long days but are worth every second! Everything went very well and this couldn't be possible without Faissal! He speaks a lot of languages (Spanish, French, English) and this for our group was very good! We highly recommend Faissal for Top Desert! Very good person! Wonderful trip from the city to the desert. Private transport with friendly English-speaking drive. Be prepared for a very long drive, but with numerous stops available along the way, some with the ability to stretch your legs. Recommend the Dades Gorge and Ait Ben Haddou as sites along the route. Erg Chebbi is an incredible spot, with the Luxury Desert Camp beyond expectations. The views are beyond belief, and the opportunity to climb pristine sand dunes barefoot should not be missed! The trip also included a private day tour with camels and another friendly English-speaking guide. The flexibility provided by the private tour was well worth it. Recommend everything! We booked with Top Desert after a great recommendation by my brother-in-law who used them a year or two ago. We booked the luxury 3-day, 2-night tour to the Sahara (Erg Chebbi) from Marrakech to Fes. The car was clean and comfortable and Rachid spoke English well. Even though our visit was during Ramadan and he was fasting while working full days and very long days of driving, he took very good care of us. It’s a lot of driving to pack into 3 days, but the scenery is absolutely breathtaking and the desert is truly a bucket list item. Both hotels (La Perle Du Dades and Luxury Desert Camp) were very clean and exceeded expectations for service. Thanks Top Desert & thanks Rachid, I’ll be recommending you guys for sure.